Venture capitalist and entrepreneur Kevin O’Leary, famously known as “Mr. Wonderful” in the award-winning business-themed program “Shark Tank,” will be coming to Manila on November 12 for the ANC Leadership Series at the Sofitel Philippine Plaza Manila. The billionaire business magnate is expected to bring his business smarts and signature no-nonsense approach to mentorship to the event produced by ANC, the ABS-CBN News Channel. Kevin is the fourth featured speaker in the ANC Leadership Series, which gathers the country’s business and industry leaders to listen and learn from some of the world’s most respected personalities and speakers. The founder of the influential O’Leary Financial Group will share how he became a successful entrepreneur, how he developed an expertise in financial management, and explain the “O’Leary Way” of aggressively grabbing opportunities in business. Born to a middle class family, Kevin has always displayed an innate business sense that led him to various entrepreneurial ways to make a profit. His first successful business venture was Softkey Software Products, which he eventually sold to toy manufacturing giant Mattel for billions of dollars. Kevin has since launched O’Leary Funds, an investment fund company, O’Leary Fine Wines, and the O’Leary Financial Group. Kevin became a household name as one of the “sharks” or investors in ABC’s “Shark Tank,” a critically-acclaimed reality show that has helped reinvigorate entrepreneurship in America. The program features aspiring entrepreneurs that pitch and defend their business ideas to a panel of investors, including Kevin, in the hopes of getting funding from them. This is where he got his “wonderful” nickname. Kevin’s television work also include Discovery’s Project Earth and CBC’s Dragons’ Den, while he has also authored best-selling books such as the “Cold Hard Truth: On Men, Women, and Money." Before “Mr. Wonderful,” ANC also brought to the Philippines Virgin Group founder Richard Branson, former US secretary of state Madeleine Albright, sports and entertainment mogul Peter Guber, and leadership guru Stephen M.R. Covey for the ANC Leadership Series, which is part of the country’s premier all-English cable news channel’s efforts to raise the level of discourse on global affairs and business issues in the country. 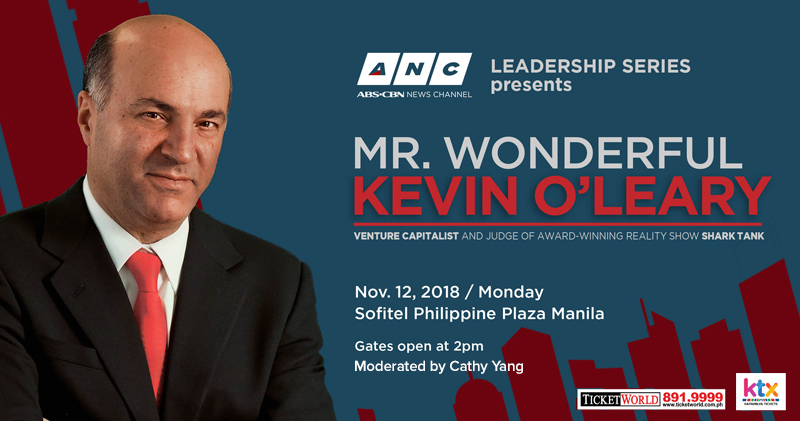 Watch and learn from billionaire entrepreneur and venture capitalist Kevin O’Leary at the ANC Leadership Series, moderated by ANC anchor Cathy Yang, on November 12, 2 pm, at the Sofitel Philippine Plaza Manila. Tickets are priced at P10,000 for Gold and P5,000 for Silver with a 20% discount for senior citizens and table buys. For inquiries and reservations, visit www.ktx.com.ph or call TicketWorld at 8919999 or log-on to its website at ticketworld.com.ph. For news and information, watch ANC, your news channel, your partner on cable. Watch ANC in high definition on cable on ANC HD. You may also visitnews.abs-cbn.com/anc or follow @ANCalerts on Facebook and Twitter. For updates follow @abscbnpr on Facebook, Twitter, and Instagram or go to www.abscbnpr.com.